I have been holding off on doing this, but due to Steve deciding that ignoring me was the best course of action I felt this should be made public. TLDR - LED shows up and has issues. Seller claims its brand new and that it worked perfectly when it left. Proceeds to ignore me instead of dealing with the problem. 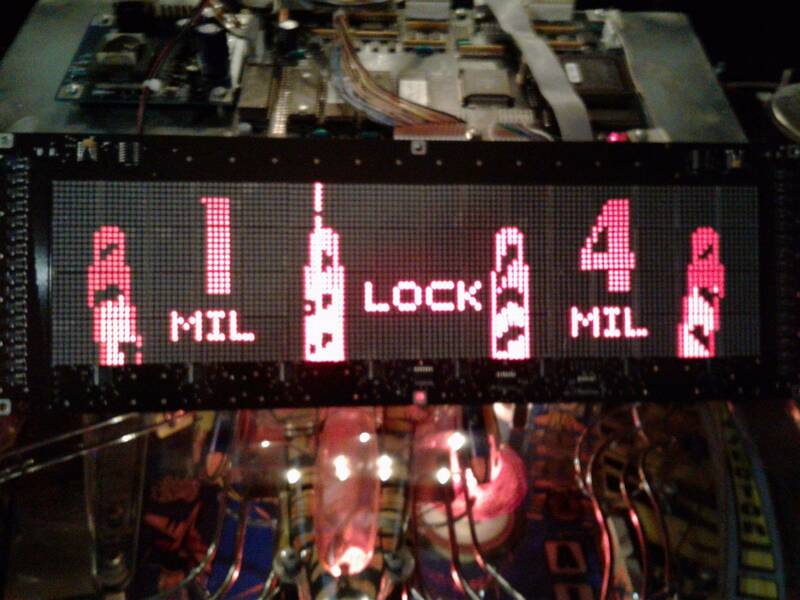 Steve Hryb of Flordia Pinball Salvage, aka CATTSS13 on here, contacted me about my ad wanting led dmd's. He said he had 3 brand new vishay red dmd's he picked up a few months ago. Now, he quickly had us switch to email and in the process of looking he was only able to find 2. He asked a very reasonable price and I agreed, no haggling. He asked for a check and I obliged and was very communicative and quick with shipping. So up until this point everything is great. I got the dmd's Friday, he had tracking on the box and can verify that. The box had no damage from shipping. Both dmd's had been wrapped in newspaper and then taped over to keep the paper from coming off. The rest of the box was filled with newspaper to act as a cushion. I tested both dmd's that day. One worked great, the other has a vertical line locked on with 1 dead pixel in that column. Here is where it goes south. If the displays both worked I wouldn't care, but these were sold as *NEW*. The display that doesn't work has light scratches on the front. 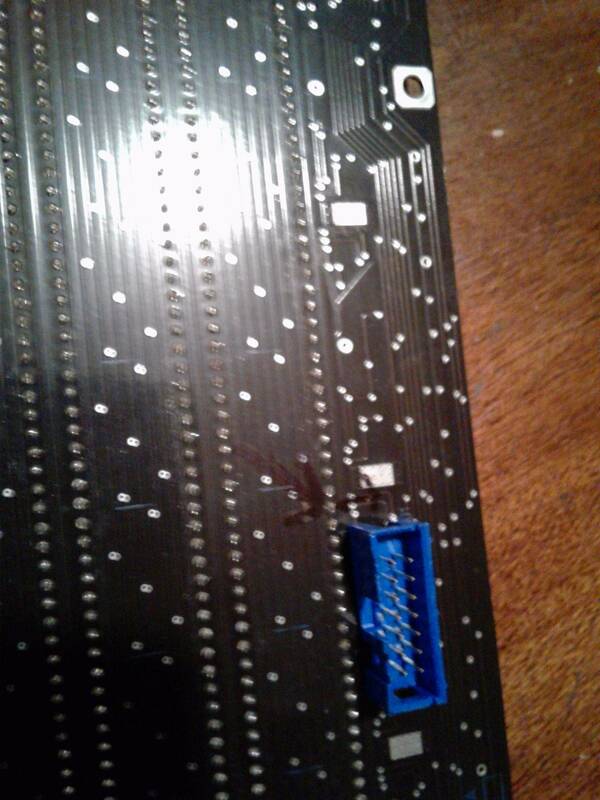 These scratches are on the pcb and there is some black removed off the led blocks. On the back is a black arrow in sharpie pointing to a random pin. Underneath that pin is the number 1. This pin is not in the column that is locked on. The second dmd, which fully works, has a random mark on a different pin and a black scribble in another completely different spot. It has no scratches. Would be happy to post the email conversation I had with steve, but do not want to violate the rules so here is a summary. So, I took pictures and sent them to Steve explaining that the dmd does not work and that due to it being smd I cannot fix it. That vishay can, but the cost will exceed what I paid for it. I get an immediate response saying that he marks what he sells so he can tell he sold it. That the displays are clearly new and that he tested them for 2 hours without issue. I explain that while not sure about the mark that it does prove that it is the display he sent. That I cannot attest to his having tested it or it being new, but that it has scratches. That if it worked I would not care, but in short he sent me a bad display and that it was doa. His response is that he marks his parts to keep everyone honest and that it worked 100 percent. That was all friday night. Saturday I sent an email offering to send the dmd back to him as having a bad display does me no good. I received no response so monday afternoon I sent another message asking if sending it back was acceptable. Still no response. Now, some may argue I should give steve more time to make it right, but from where I sit he has known since friday that there was a problem. At no point did he offer a solution, he simply dug his heels in stating that it worked when he had it. Now, things happen. Maybe it got shocked while he was wrapping it in newspaper or it got shocked in transit? I don't know, all i know is I the display was bad from the word go. I have tested it in multiple machines, with different ribbon cables and it has the same issue regardless. Apologies for the long winded post but trying to be as fair and clear as possible. Going to attatch the photos that I sent steve on friday. My spidey sense went into overdrive when I read the word salvage in the trading name. I've dealt with Steve for close to 20 years without a problem. I'm sorry that your having issues. Hopefully you both can work this out. Before sending payment I dug through rgp and found numerous posts about steve. A few complaints about him being slow to respond or ship, but everyone seemed happy in the end. There was nothing about receiving a bad product. I have already heard that steve has been active with others this week so it does indeed seem his way of handling this is to just ignore it. Now both parties feel they are in the right. There also could be details that are pushing the seller to not want to deal with the situation. Just a suggestion, but maybe a compromise/negotiation could be reached? Like a partial refund and OP keeps the bad DMD for parts. In situations like this, both parties can feel like the other person is trying to rip them off. We never got to negotiating. I offered to send it back and steve went silent. In terms of you saying I might have damaged it how else am I supposed to handle this? As the buyer I tested them the day they were delivered. I disconnected my working stern lv dmd, plugged each of these in. One worked, the other doesn't. The displays use 2 keyed plugs so its kind of difficult to screw this up. I emailed the seller immediately with pictures to show the issue. This isn't a case where they were sitting in my position for weeks on end and I only just got around to it. I don't understand the attack the victim mentality here. Dung is no noob who can't wait 20 minutes for his item to ship! Regardless of item price. If it was advertised as new it should work. It was not sold as-is. It arrived not working. The seller should not be ignoring his clients no matter how long he has been in business. Dung, can you get an estimate on repairing these (including shipping)? Maybe ask for a refund of that amount? FYI-Over the past few years I have bought a few displays and parts from Steve and had no problems. I bought an 8 ball deluxe back glass from Steve last year. It was very slow to ship as in he completely forgot about it after I paid. He did end up shipping it weeks later and it was in very nice condition. He did mention he had a stroke or heart attack not long ago which has been causing him to have problems keeping up with the business. Steve offered to sell me an Earthshaker backglass at a discount to make up for the long shipping delay. He told me to contact him after I received my 8 ball deluxe backglass. I tried contacting him and got nothing but silence. Honestly I am just not seeing that it is worth repairing. From where I sit I paid 100 for each dmd and then 12.50 shipping a piece. That is about what a similar stern lv runs. Repair does not have to cost much for it just to not be worth the hassle. This is why I offered to send it back. I do not want Steve think I am trying to rip him off. He says he put the marks on the back and can verify his own handiwork. That way he can see that it is the dmd he shipped me and that it does indeed have issues. That's the way the cookie crumbles sometimes. You live and you learn. Oh, and you overpaid for those displays. If I see the word "salvage" in the title, I'm not paying that much for anything! If you do not hear from him by tomorrow, ship it back with signature confirmation at your expense and reverse the charge after it has been received. So I can sell anything I want marked as "new" and it doesn't matter what the actual condition is as long as I put "salvage" in my business name? Guys, I'm selling new homes (and bridges!) in Brooklyn. Contact me at Brooklyn (and Bridge!) Salvage for more details. I hope you get it worked out dung. Something that has been repaired is no longer "new". Refurbished perhaps, but not new. Kinda hard to reverse a check--which is what I think was used in this transaction if I read the original post correctly. You can try, but I'm not going to be dumb enough to buy it. No risk, no reward, but its nice to see you on here dirtbag. Yes, by check so I won't be shipping it back unless Steve decides to chime in. By now I am sure he has been made aware of this thread. If not I planned on reposting this to rgp, klov, and facebook groups. If nothing else the community needs to be made aware so that people can decide if dealing with him is worth the risk. To be clear, I was not saying that you damaged it. But it could have been working before being shipped, and thus the seller is saying not my fault/problem. Like I said the first time, it's the type of situation where both parties may feel that they are 100% in the right and the other party is trying to take advantage of them. I am not saying that you are trying to take advantage of the seller - it's just an unfortunate situation that might require compromise from both parties. Even then, both parties may feel taken advantage of. I was thinking Steve was just some person selling a couple displays. Now that I see this is a business it changes the relationship, he should definitely be the one to make it right. To be clear, I was not saying that you damaged it. But it could have been working before being shipped, and thus the seller is saying not my fault/problem. The seller should have insured the shipment for this very reason! I don't suppose any insurance was purchased for the shipment? The box had no signs of damage. I have already thrown it away but if there was damage during shipping it wasn't because usps drop kicked it. Bummer, I know from a business standpoint we have filed multiple claims with UPS specifically, as boxes were undamaged but once opened it was clear contents were damaged in transit, Doesn't sound like a case for that here though. Seller chose shipper, seller packed the item, seller needs to make sure it gets to buyer in working condition. Since seller marked his item to prevent switcheroos, there is no reason he shouldn't accept a return for defective merchandise. On Cattss13 forum activity pg, it is easy to see he has been an active Pinsider selling items. Thus, since little to no complaints in recent past, it sounds like this particular sale just is one of those cases that had a product issue come up during transport. Seller needs to just work something out agreeable to both parties, and put it behind him. It appears seller has filled many orders properly. Things happen occasionally. Sounds like buyer is not trying to screw anyone imho. Hurry up and resolve, so we can get back to playing pinball. Steve is one of the good guys. I hope this gets resolved quickly. Known and been doing business with Steve since the late '80's. Never an issue. I hope this works out for everyone. I hav me dealt with Steve and he is always fair. Slow to ship sometimes but always a good experience. Good luck. I think we can close this one down now. Steve offered to refund me 100 and told me to keep the spare display. I think I will end up looking into how much vishay would charge to repair it or possibly shelve it for parts if what steve sends won't cover the repair + shipping. Meaning, just because you got good working displays doesn't mean he's flawless as I'm sure you know. Glad to hear this worked out. Sneaking in late: abridged version: my experience with him is great. Looks like Steve is a good guy. That's basically refunding the full price paid for the display less shipping, and the op gets to keep the bad display which could be fixed or used for spare LED cubes. Glad it all worked out. I would suggest changing the title to compromise reached or seller made good if you think he did right by you. Over the years I have found 95% of the time people will make things right in the end. But I have also come to realize we all have lots of stuff going on in our lives so sometimes things don't happen as quickly as we would like them to. In any event time to change the title of this post to Issue Resolved! You should wait AT LEAST a week before starting a thread like this. Glad it has been resolved, but perhaps give it a little more time next time. Seems like this thread helped get the issue resolved. Seller gets credit for resolving and not dragging it out in a big drama fest. In most cases yes, I agree. But the seller had been seen here on Pinside and wasn't responding to the OP so there is no excuse. It takes nothing to email/pm and say give me a day or so to sort this out. I can see why the OP called him out immediately, and it got resolved. The seller is not a big internet user. He may post something for sale and give info on where to reply and that's it. He's not one to read posts or participate, so being seen here is a little different in his case. I'm not sure he even knows this thread exists. Sorry, but not sorry guys. Steve has stepped up and offered a solution I accepted. No hard feelings toward him and I am done posting on here about it after this. Anyone who thinks I needed to wait or that I should apologize really needs to reread the thread. After posting this I learned that the seller was in communication with others via email for the 5 days preceding this post. He knew there was a problem with the product he sent me. We exchanged multiple emails where he claimed it worked when he sent it. I sent two emails offering a solution and he stopped talking. Between my sending the emails with a solution and posting this he was emailing other people. Anyone who still thinks differently, we will just have to agree to disagree.